The outcome of the election was strongly contested by factions of the Polish nobility that supported the candidacy of Archduke Maximilian III of Austria, who briefly invaded the country. Upon hearing of his election King Sigismund slipped through the clutches of the Protestants in Sweden and landed in Poland on 7 October, immediately agreeing to grant several royal privileges to the Sejm in the hope of winning over some of his opponents and settling the disputed election. He was proclaimed by the Lesser Prussian Treasurer Jan Dulski as king on behalf of Crown Marshal Andrzej Opaliński, and after arriving in the Royal Capital City of Kraków he was crowned on 27 December at Wawel Cathedral. Ultimately, Hetman Jan Zamoyski defeated Maximilian at the Battle of Byczyna and took him prisoner. However, at the request of Pope Sixtus V, King Sigismund III released Maximilian, who surrendered his claim to Poland in 1589. King Sigismund also tried to maintain peace with his powerful neighbor by marrying Archduchess Anne Habsburg in 1592. It was always his intention to maintain an alliance with Catholic Austria against the Protestant forces. Działyński informed Elizabeth that Sigismund was intending to marry a Catholic member of the Austrian royalty and was sympathetic to the Spanish Crown. The reason for his mission was to complain about Elizabeth's policy of having her navy capture ships of Polish and Hanseatic League merchants trading with Spain. This was intolerable to his sovereign. Hostilities would have commenced if Elizabeth had not rescinded her orders to interdict trade, release the captured ships, and restore the confiscated cargo or make restitution. The Polish nobility of the Commonwealth had become excessively dominant, and its primary aim was to remain in power. The lower and middle classes were often exploited and heavily taxed by wealthy or influential families of that era. This created a sense of fear among citizens of towns and villages that were privately owned by nobles. Sigismund, as the Head of State, always sought to restrict the privileges of the upper classes and decrease the nobility's influence over the parliament in order to personally gain control. This caused disdain for the monarch and many rebellions occurred during his reign. These revolts, however, were all crushed by Sigismund and the nobles eventually surrendered, having achieved little. Furthermore, one of Sigismund's desires was to be admired and idolized by his subjects; the unsuccessful rebellions were significant in strengthening his influence over the people and the country's politics. The Sejm, however, was still directly responsible for the majority of the Commonwealth's affairs, most notably declaring wars and suing for peace. The King was unable to officially declare a war if the decision was not fully approved or supported by the Sejm and the Senate. The Sejm usually consisted of approximately 600 nobles, diplomats and most influential politicians, who met annually at Warsaw or elsewhere, in order to contribute as little as possible to public needs and protest vehemently against everything they did not like or could not understand. The nobility was also in favour of absolute non-intervention in foreign affairs, as the cheapest and least troublesome policy to pursue. The unwillingness of the Polish gentry to part with their money, especially for armaments, was entirely due to the fear that a popular monarch might curtail their privileges. Rather than run that risk, they avoided every advantageous alliance, forgoing every political opportunity, stinted their armies, starved and abandoned their generals, and even left the territories of the Commonwealth unguarded and undefended. This was the case of Livonia, with its fine seaboard and hundreds of towns and fortresses, which had temporarily fallen into the lap of Poland. It was later retaken by Sweden due to poor organization of the army and disinterest of the nobles to finance any military actions or campaigns. The regular army, on the other hand, was very effective against enemy troops, especially in Polish-occupied Ukraine (Ruthenia), where it had an almost unlimited reserve of the best raw military material. Moreover, the army was led by Zamoyski, Żółkiewski, Chodkiewicz and Stanisław Koniecpolski, four of the greatest generals and military commanders. The election of Sigismund III proved to be the greatest possible blow to inflict upon Protestantism in Poland. Brought up by his mother, Catherine Jagiellon, in the strictest Roman Catholic doctrines, he made Rome's interests the guiding motive of all his actions. This zeal for Rome outweighed all considerations of prudence or policy; through it he lost two hereditary thrones and brought innumerable calamities on the country that had elected him "In order to make sure of heaven he has renounced Earth" as said by Emperor Ferdinand II of the Holy Roman Empire. The Protestants called him the King of the Jesuits, and Sigismund gloried in the appellation. This feeble imitation of Philip II of Spain possessed all the bigotry and zeal of his model without his abilities or strength of character. Sigismund was heavily influenced by the Jesuits; according to contemporary opinions he bestowed honours only on those whom they favoured, and preferred their advice to that of his wisest counselors. By private interviews, wrote a Roman Catholic historian who was also bishop of Przemyśl, which they could always command, the Jesuits so bound the king by their solicitations that he did everything according to their counsel, and the hopes and cares of courtiers had no weight except by their favour. Chief among these advisers of the king was Piotr Skarga, one of the most eminent of Polish Jesuits. Born in Mazovia in 1536, he was educated at the Jagiellonian University, where he distinguished himself by receiving an academic degree prima Laurea. He then proceeded to Rome, where he entered the society in 1568. He began his preaching at Pułtusk, and visited the colleges that Stephen Báthory had founded in the distant cities of Riga, Dorpat and Polotsk. Skarga's eloquence was very successful, and even now his sermons are thought highly of in present-day Poland. On the accession of Sigismund he became royal chaplain and he founded a confraternity of St. Lazarus in Warsaw and many other establishments elsewhere in the country. 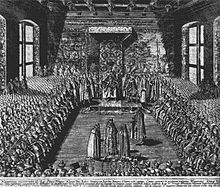 An unsuccessful attempt on the life of the king was made on 15 November 1620. It occurred on Sunday at 9 in the morning when the monarch was to attend mass in St. John's Archcathedral in Warsaw. Sigismund was to arrive by crossing a wooden bridge-looking structure that linked the Royal Castle with the temple. When the royal procession reached the end of the bridge, hidden in a nearby window was petty nobleman Michał Piekarski armed with a war hammer. The assassin previously killed a Hungarian mercenary who was standing guard and the royal cook. When the monarch reached the final steps, Piekarski leaped out and threw himself on the king, stabbing him twice, firstly in the back and then in the cheek, and striking him in the arm. However, he was not able to deliver a fatal blow due to the intervention of royal guardsmen standing to the right of the king as Piekarski leaped from the left as well as Court Marshal Łukasz Opaliński who shielded the king. Concurrently, Prince Władysław wounded the assassin with a sabre on the head as he tried to protect his father. Parishioners gathered around the pale and lifeless king, who collapsed to the ground after the incident. The guards were able to revive him and after a medical examination the wounds were found to be non-life-threatening. Chaos erupted when false rumours spread that the king had been murdered as his clothes were stained in blood. Initially, it was thought that the city was invaded by the Tatars. The circumstances of this attack and the assassin were known exceptionally well after the attempt, as pamphlets soon appeared on the Market Square reporting three different viewpoints on the subject, published in a total of five editions. The assassin was indeed Michał Piekarski, widely regarded as a mentally unstable melancholic, unrestrained in deeds, who as a child had suffered a head injury. Piekarski's most probable cause for the assassination was fame and recognition; the successful assassination of Henry IV in Paris (1610) by François Ravaillac served as motivation for his actions. For the appropriate moment Piekarski waited patiently 10 years. At trial he did not deny the crime he committed and heavily insulted the jury, the Court Marshal, and the monarch. He was executed in a similar manner as Ravaillac on 26 or 27 November 1620 in Warsaw, in a torture area called Piekiełko (Devil's den or Devil's place). He was publicly humiliated, tortured and his body torn apart by horses. Sigismund made the Commonwealth the dominant power of Central and Eastern Europe and ensured that Poland remained a solidly Catholic country in the face of Protestant incursions. He was considered a brave man, a talented monarch and something of a Renaissance man as is evidenced by his devout faith and his artistic talent. Sigismund was a gifted artist, painter and goldsmith; only one of his three paintings survived – one was for centuries erroneously attributed to Tintoretto. From his personal workshop came the main part of the famous silver coffin of St. Adalbert of Prague at the Cathedral in Gniezno. Moreover, Sigismund was deeply interested in alchemy and ancient methods of turning metals into gold; he often cooperated with the famous alchemist and philosopher Michael Sendivogius (Polish: Michał Sędziwój).